This piece on the 60th birthday of the container – including great conversations with a longshoreman, a beachcomber, the owner of a restaurant made out of a shipping container, and with Alex Colas and Saskia Sassen- is by Tristan Stewart-Robinson. This news item from the BBC is about the uses of shipping containers as instruments of policing. And this one is about the shipping container as a vehicle of migration. And architectural gems made from shipping containers seem to capture people’s imaginations. And this one. And this one too. And the other uses for containers. And this one too. This entry was posted in infrastructure, political economy, shipping conditions, transport. Bookmark the permalink. 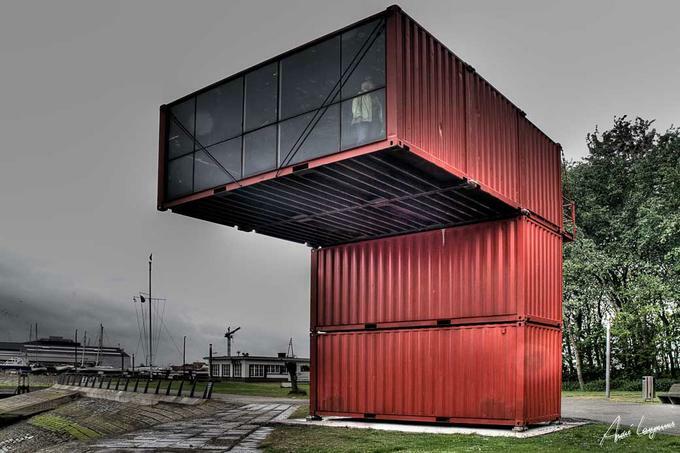 The Belgian artist/architect Luc Deleu has made a number of interesting sculptures or ‘architectural intervention in public space’ with shipping containers.